Chili peppers, right hand above, left hand below. I'd forgotten about drawing with the left (or non-dominant) hand, it's an incredibly useful thing to do. My right hand is stronger, but my left hand sees different things. 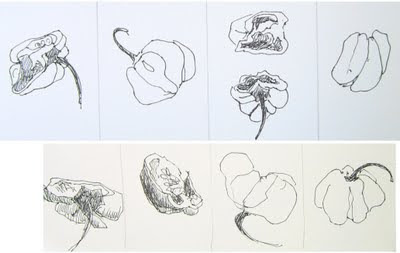 The difference shows up in, say, a set of one-minute gesture drawings. My left hand will start in different places and pick out or emphasize different parts of the figure in action. I don't think it would happen as much if one was self-conscious about it, and the great thing about one-minute drawings is that they don't allow time to think. My left hand nearly always does more interesting things. It's really worth a try when one is desperate and nothing is going right. The drawings above are ordinary drawings, not restricted to one minute. Right hand above, left hand below. Not sure they prove anything but I prefer the left-handed ones.